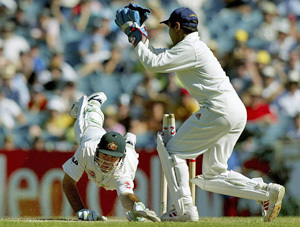 Wicket keeping Drills - A keeper should try and simulate matches. A keeper should try and simulate match conditions as much as possible in his drills. The point of focus in every activity should be specific to his developmental needs. In all the drills, the major focus should be the ball. The keeper should watch it all the way, right into his gloves. For bowlers who are 'medium-fast', like Heath Streak, Darren Gough and L. Balaji, the keeper should stand around 14 yards from the stumps when the ball is new. But with a ball that is 6-8 overs old, he may well use his discretion and judgment, and think in terms of 'standing up', close to the stumps. This will give him the opportunity to pull off stumpings if the batsman stretches forward and misses. One remembers Indian stumper Sadanand Viswanath 'standing up' to Madanlal against England in the 1985 World Championship of Cricket and taking a superb reflex catch to dismiss Richard Ellison. Some bowlers tend to get more confident when their keepers stand up, although there aren't many who feel this way in international cricket at the moment. Alec Bedser, England's bowling great of the 40s and 50s, was one such. Another factor that comes into play in 'standing-up' matters is the match situation. Even if the keeper wants to stand up, the captain or bowler may overrule him if they want to cut out the possibility of the batsman getting a thick edge and the ball sailing past the keeper for a boundary.